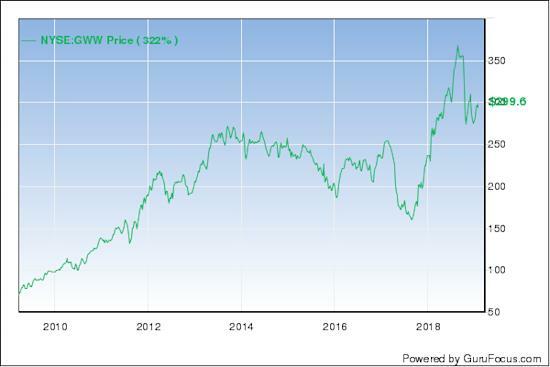 Last July, I wrote this article on W.W. Grainger (GWW) and its main competitor Fastenal (FAST), stating both companies were strong, but that Fastenal was a better buy at the time. Fast forward nine months, and it's Grainger that gives investors a buying opportunity. Warning! GuruFocus has detected 3 Warning Signs with GWW. Click here to check it out. The industrial supply company founded in 1927 in Chicago by William W. Grainger has continued its upward financial march. At the end of January, the company reported fiscal year 2018 GAAP earnings of $3.68 per share on revenue of $2.76 billion, which was up close to 5% year-over-year with both operating margin and operating earnings improving. The company is a dividend darling that has increased its payout every year for 46 years, generates 42% returns on equity, spends less than one-third of its net income on capex, and has helped its owners increase their stake by buying back nearly a quarter of its shares since 2009. Since 1996, Grainger has allocated roughly $15 billion of shareholder capital to capital expenditures (25%), acquisitions (10%), dividends (19%) and share repurchases (46%) with 80% being funded with operating cash flow. The same is likely to hold true over the next decade. As the company transitions from brick and mortar to digital commence (it already has the 10th largest site in North America) the growth could pick up steam, especially on the bottom line. Amazon (AMZN) Business could disrupt the industry, taking share away from Grainger and putting pressure on its margins, or it could flounder because of Grainger's entrenchment in the market. Either way, the pie is still big enough for both to grow, and competition is ultimately good for the end user. Grainger serves more than 3 million customers with products sourced from over 5,000 suppliers, and distributed through its online platform and network of 500 retail locations. This scale is hard to replicate, which is why Grainger is expected to earn north of $20 per share in 2020, putting its forward earnings multiple at 15x, a full six notches lower than its historical average. If earnings per share come in at $20 in 2020 and the stock price is closer to the five-year average multiple, shares could reach $440 by 2021, a 50% when dividends are included. Buying below $300 at this point is worth the risk. Disclosure: I am not long or short any stock mentioned.